Vietnam is foodie heaven for learner cooks. By Jason Burgess. At 11am beneath the multi-coloured tarps of Hoi An's cooking market, the mugginess is cloying and the trade is brisk. Scents of coriander, lemongrass and basil lace the air, kaleidoscopic fruit stands with luminescent chilli and fresh herbs distract the eyes. The market visit is my initiation into the Morning Glory Restaurant's cooking class. It's a half-day culinary adventure where, under the tutelage of the dynamic Madame Trinh Diem Vy (pronounced Vee), a one-woman hospitality industry, I cook a delicious 10-course lunch that draws from Vy's family recipes, street foods and local specialties. First, though, we must source some produce. I nearly lose our group as I stand transfixed by a dexterous woman who with one hand deftly fillets river fish before rapidly transforming their flesh into hand-rolled spicy fish balls, with the other. I finally catch our effusive guide explaining three sizes of garlic: "The largest for soups, medium for marinades and the smallest for medicine." She then instructs us to pick some fruit, "One mango: the uglier, the better." And a papaya, "Pierce skin with nail, if milk comes out it is fresh." Ingredients don't come any crisper. At Morning Glory we will assemble a green papaya salad to accompany a spicy prawn curry and a green mango salad to augment a chilli and chicken specialty. "Vietnam is a heaven of spices," begins Madame Vy as she holds aloft a mortar and pestle. "The first thing a mother asks a daughter to do in a Vietnamese kitchen is pound the garlic and chilli in a mortar and pestle. Garlic first, then the chilli. If this is not done right then the flavour is said to be "not full chilli in eye." My condiments are pre-chopped, ground and plated expressly for my needs, all I need do is follow Vy's instructions and, rather miraculously, I too will turn out finely balanced fare. Our starters include fresh spring rolls (also known as summer rolls) followed by crispy pancakes with a peanut dipping sauce. The recipes are exhaustive in detail, but Vy's army of assistants are on hand to help make sense of the process. Beneath the kitchen's giant mirror the diminutive Madame Vy commands the room. Although barely 40, she already has 30 years of restaurant experience and a growing list of firsts to her name. It was Vy who opened Mermaid, the first restaurant to cater to foreigners visiting Hoi An. She was the first Vietnamese chef to start a cooking class in town and the first to see the need for a patisserie-style cafe, The Cargo Club. More recently this kitchen whizz has published her first book: Taste Vietnam, The Morning Glory Cookbook. In the late1980s, as Vietnam's doors tentatively opened to Vietnam tourism, Vy was already cooking and serving in her father's cafe. She really found her calling when a group of Irish tourists came in for lunch. "They so enjoyed their meal they asked if they could come back for dinner." She told them that the "Vietnamese people go home for dinner so the cafes are closed." They were unrelenting and finally she said she would cook for them. She asked her father to help but he wasn't interested so single-handedly she turned out the meals. For four straight days the Irish kept coming for meals and Vy obliged. 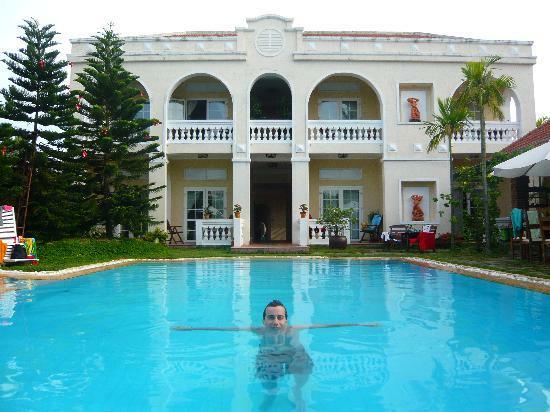 In 1993 there were just eight rooms for rent in Hoi An. Vy was barely a teenager but she says, "With the country slowly opening up I saw an opportunity." Not only is she an iconic figure on Vietnam's food scene, Vy is also a hotelier of the boutique Cua Dai Hotel. Culture and food are still intrinsically linked in Vietnam. As I dutifully compose a complex dish featuring traditional Cao Lau noodles whose water comes exclusively from the local Ba Le well, Vy says, "In Vietnam, to serve a good meal is to show regard for your fellow people." * Hoi An once rivalled Macau and Melaka as a trading port. Much of the mustard-coloured edifices that straddle the Hoai River date back to the late 18th and early 19th centuries, some as early as the 1600s. * In 2000, Hoi An was granted Unesco World Cultural Heritage status. There are more than 1000 protected sites including ancestral homes, tombs, commercial buildings, temples and wells. The old streets are the Vietnam of postcards. They are closed to traffic which, anyone who has experienced Hanoi or Saigon will tell you, is true bliss. * Aside from some of the country's top restaurants, there are artisan galleries, handcraft stores, an abundance of shoe shops and plentiful tailors. It's possible to get shod and fully clothed within 24 hours, with many a seamstress able to faithfully pattern from clients' pictures. Sewing machines work through the night, using cotton produced on old-time wooden looms in the town's mills. * Three kilometres from town, the palm-lined white sands of Cua Dai beach begin a 30km arc north to Da Nang. During the Vietnam conflict, US servicemen rechristened this porcelain strip of coastline China Beach. There are plenty of resorts on the coast and a plethora of historic places to stay in town, with something to match every budget. * History buffs will be sated by the ruins of the Cham Kingdom at My Son about 70 km inland from Hoi An. The Unesco-protected temples were shrines to the Indian goddess, Shiva. Over the centuries they have been sacked by the Khmer, the Chinese and latterly shelled almost into oblivion by the Americans in the 70s. My Son is currently being rebuilt. The valley here is sweltering so it's best to arrive at dawn or dusk to avoid the sun and throngs of travellers. A trip in a cab will set you back about US$20 and US$25 return. Some tour companies can arrange river transport back to Hoi An. Hoi An is approximately one hour's drive from Da Nang airport, bus and railway stations. BOOK A CLASS. Where to stay: The Cua Dai Hotel is a short walk from the historic quarter of Hoi An. Standard rooms start at US$37 for a single through to deluxe at US$66 a double, including breakfast, by the pool. Trips to Cua Dai beach, My Son and Da Nang can be organised by staff who will put you in touch with reliable drivers for bespoke tours. Bus tours can be booked at the front desk too. Motorbikes can be hired next door. What to do: Morning Glory offers six cooking programmes, priced from US$20 to US$55. I attended Cooking for Beginners to Intermediate level with a market tour and hands-on class and meal. Where to eat: You can visit Mermaids and the Cargo Club Patisserie which sits on the opposite side of Nguyen Thai Hoc street from Morning Glory. Bookings can also be made here for the boutique Cua Dai hotel.